Having Jesus as our Lord does not mean that we bulldoze over others with this important eternal reality. Gentleness and respect are the character traits of those who have Jesus as their Lord. After all, Jesus loved others enough to die for them. Jesus even asked for those who crucified him and those who mocked him as he died to be forgiven. Having such a Lord means we have prepared a response when we are given and opportunity to share the basis of our hope in him. Those around us may not appear interested, but many are seeking for something they have not yet identified. Let's be ready when their time is right to meet Jesus! Holy and gracious God, please give me wisdom to see the opportunities to share the love of Jesus with those around me. 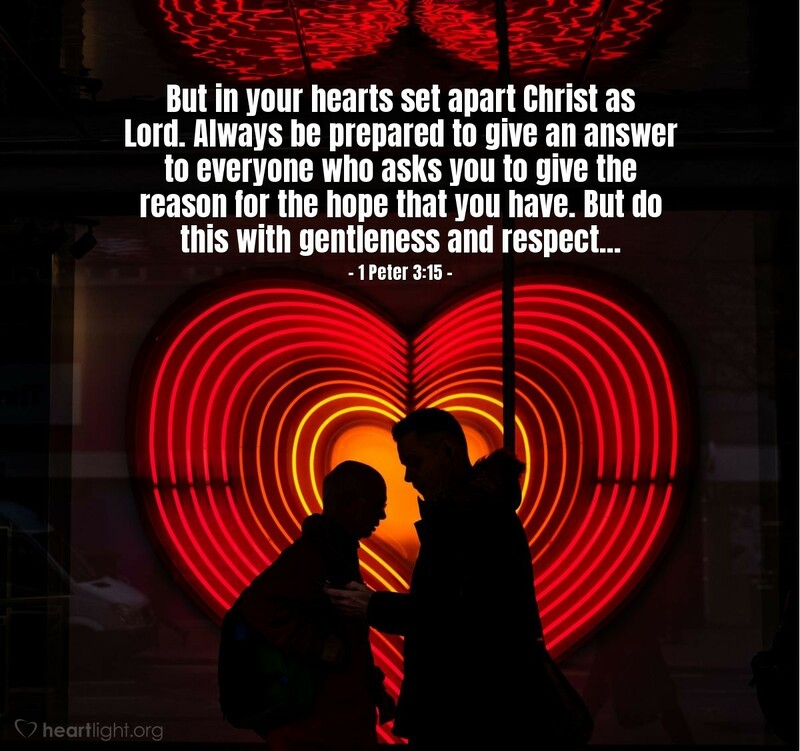 I ask you to especially help me be able to share Jesus with several of my friends that I now mention by name... Father, please give me the gentleness to do this redemptively, showing them the same respect Jesus did with those to whom he ministered. In the name of the Savior, your Son Jesus, I pray. Amen.